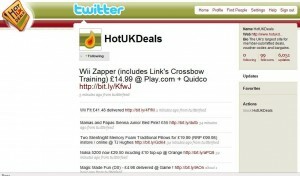 If you are on Twitter, you are based in the UK and you are on the lookout for bargains and discounts, have you come across the HotUKDeals feed? I hadn’t until the other day, but I’m really pleased to have stumbled across this feed’s path. 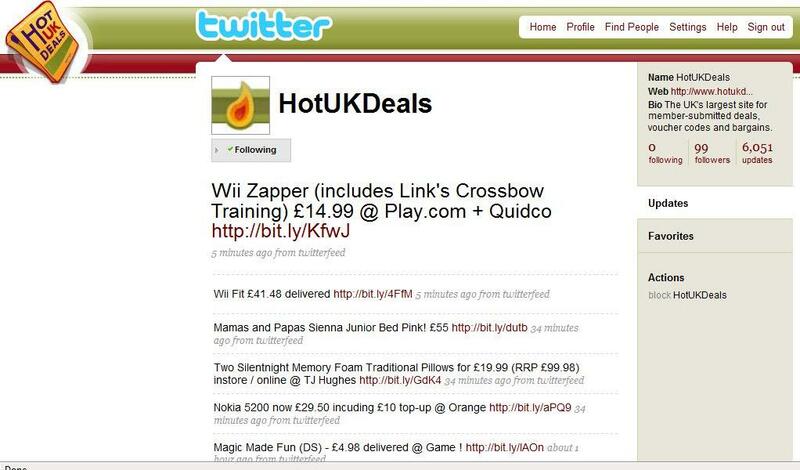 It does what it says on the tin, and is the Twitter version of hotukdeals.com: a website and forum devoted to hot-off-the-presses deals and offers. On Twitter, HotUKDeals tweets the bargains throughout the day; put it this way, right now there are plenty of them to get your teeth into. The website has 150,000 registered members but at the time of writing the Twitter feed boasts a comparatively modest 99. So I’m giving it a plug, because I like it! Today, for example, I have learned that there is tons of slashed-price Wii stuff knocking about, that Heinz baked beans (the barbecue ones) are 11 pence a tin at Tesco and that Matalan is doing sets of bedding for £1.49 a pop. There have been Twitter feeds for US-based deal sites for a while – @FabuDaily and @FrugalJulie are two that have caught my eye – so it’s good to have a UK version. Well, good for us Brits anyway. Oh, and if you’re on Twitter and you haven’t yet checked out @MissThrifty… heck, what are you waiting for? I still can’t figure out twitter! This is awesome. Many thanks. I normally first subscribe to the RSS Feed; I can check out the tweets without them knowing and only start following when I am confident their tweets are quality. Do they cover the UK or only England?